Physical activity is any activity that moves your body and increases the amount of energy you use. Regular activity makes you stronger, improves your balance and helps prevent falls. Ask your doctor, physiotherapist or health care provider about the best type of exercise program for you. To achieve health benefits and improve functional abilities, adults aged 65 years and older should do at least 150 minutes of moderate to vigorous intensity aerobic physical activity per week, in chunks of 10 minutes or more. Strength and balance exercises, such as lifting light weights, stair climbing, tai chi. Endurance exercises, such as walking and dancing. Flexibility exercises, such as tai chi, stretching, and yoga. Tell your doctor or health care provider if you have had a fall. We’ve collected some great resources to help you exercise at home, as well as tools to help you find exercise classes focused on increasing balance and mobility. A physiotherapist can help design a simple program you can do on your own to help keep you moving, and does not require a doctor’s referral. Vancouver Coastal Health has a great falls prevention resource, Stay on Your Feet, in English, Chinese, Farsi, and Punjabi. To find a physiotherapist near you who can help you with developing a simple personalized program of realistic exercises you can work on. To find Physiotherapist in BC, use this tool on the Physiotherapy Association of BC website. 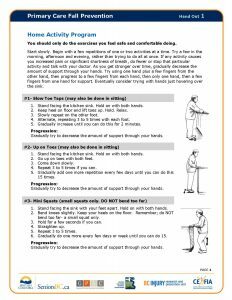 Click on the image below to download the Handout on Home Activities. Exercise videos that demonstrate the exercises included in the 3 levels of the SAIL Home Activity Program. Videos are shown in multiple languages, including: English, Farsi, Chinese and Punjabi. CLICK HERE TO ACCESS ALL VIDEOS IN THE SAIL HOME ACTIVITY PROGRAM. The exercise videos will open in a new window. 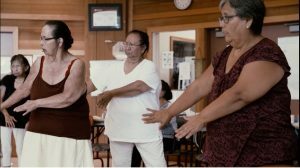 Tai Chi for Elders from Hip Health and Mobility on Vimeo. Find an exercise program in your area using the links below or contact your local community centre.